This smart jacket distributes weight evenly and is both lightweight and comfortable to wear. Lowepro's S&F Technical Vest is intended for photojournalists and sports photographers who may require quick access to their equipment. It's designed to be used with the rest of the company's S&F series, which includes various bags, pouches and belts, and is bestowed with a number of loops that accept the SlipLock tabs common to products in the line. 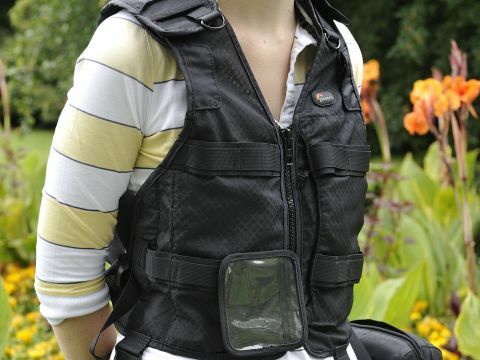 Available in two sizes, the vest is made primarily from nylon and has a sturdy metal zip in its centre. There's a large plastic holder for identification, which may be removed if not required and the loop used for a different accessory, while the collar is padded to prevent neck chaffing. Around the back there's an open-ended pocket, which can be used to store a jacket or another small item of clothing. On the inside, meanwhile, two meshed pockets have loops on their sides to enable cables to pass through (such as for earphones), and one of them may be closed securely with a Velcro pad. On its own the jacket is lightweight, and when used correctly with an appropriate number of bags it distributes weight evenly, although this depends on how tightly the jacket fits or is adjusted to fit by the straps. Lowepro recommends pairing the jackets with one of its belts, which is said to further improve weight distribution and has the advantage of a greater number of loops, although this incurs an additional expense of around £40. The Lowepro S&F Technical Vest is lightweight and comfortable to wear, and a practical solution for those needing a range of lenses or accessories to always be to hand. Although not expensive in itself, the cost can escalate once a few bags and pouches are added.